In part two of our discussion of the Western classic The Searchers, we discuss listener feedback regarding how challenging it is to recast an iconic role and actor like John Wayne, as well as suggestions for how that might be done. We talked about how the original film lacked sensitivity, both racially and in terms of mental illness, and suggest some ways to do both of those things better in a remake. 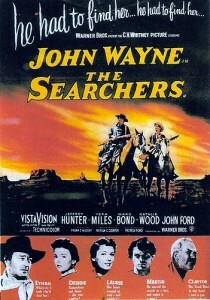 Since this was our first Western, we talked about the genre a bit, both in terms of The Searchers’ place in its history, as well as the strengths and weaknesses of it, and wondered if and how the Western could fit in today’s film world. Finally, we express umbrage with the strange mood shifts throughout the original – for a very serious film, it sure had some strange, out of place bits of levity and humor. Throughout these discussions, Kyle confuses Ozzie Nelson with Ricky Nelson, the guys hate on New Jersey and Estonia alike, we speculate that a CG John Wayne might make an appearance in Pacific Rim 2, and Kyle manages to slip in some Vanilla Ice lyrics. Next episdoe’s movie – ¡Three Amigos!